It’s finally gotten cold in Toronto – cold enough that we actually turned on the furnace yesterday. I guess it’s the cold that’s got me thinking about nesting, being cozy and the upcoming party season. I realize people have all sorts of parties to attend and host, but also that their individual party style varies hugely. With that in mind, I’m setting out to stock my Etsy shop with a nice variety of jewelry picks – something to suit most party personalities out there. Here are a few examples of what I’ve created so far. 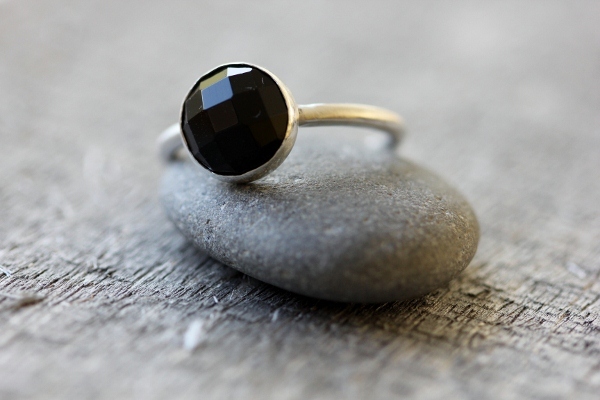 First is a very simple, minimalist black faceted onyx ring in sterling silver. I love its simplicity, but the faceted onyx is also somewhat retro, recalling the ’20s and art deco. 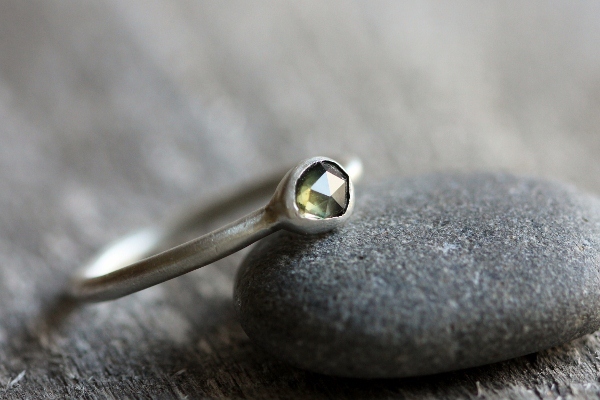 Next, I did a really pretty pale green faceted sapphire and sterling ring, which is quite dainty, clean and modern. This little freeform sapphire is at once organic because of its freeform, flowing shape, and also a little formal due to the geometric, rose cut facets. The stone is the palest of greens with a touch of blue on one side. I gave the silver a satin finish – really clean and modern. 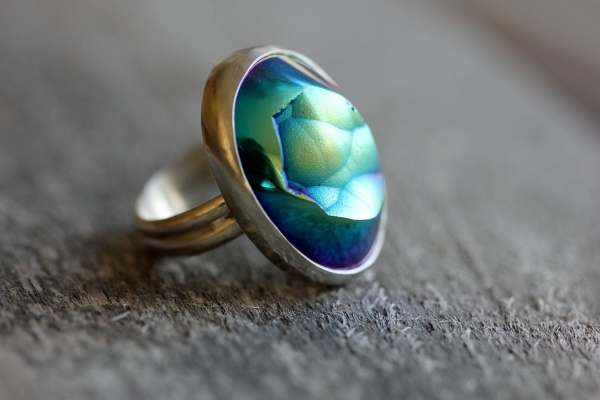 The third party ring I made is truly a “cocktail” or “statement” ring. It’s fun, big, colorful and is the life of the party – or for someone who likes to make a splash every day. The amazing stone is a botryoidal (bubble shaped) agate with a brilliant iridescent coating, which gives it its peacock coloring. Because of how spectacular this stone is, I gave it a very simple bezel setting and a sturdy but simple double half-round sterling band. So now I want to know: which one are you?? ?